Green Vegan Living: Good Food and More Good Food! What's a Girl To Do? Good Food and More Good Food! What's a Girl To Do? Eeek! I'm sooo excited about my favorite taco cart opening an actual restaurant. I'm sure you'll be seeing me there quite often. I went on a baking and cooking frenzy yesterday. I was spurred on by a friend's request that I make kolacky, or Polish shortbread, and since I finally had all the necessary ingredients, I decided to make them as well as a few other amazing foods. Plus, it was raining and cold outside, and I had no desire to go out, so I stayed in and hung out with my warm oven instead. In all, I made an absolutely delicious sandwich (as a tribute to the pretty fantastic veggie supreme sandwich that I had at Bob's Red Mill the day before), banana flax muffins that turned out phenomenally well, and the kolacky. By the time evening came, I had probably gained about 5 pounds from all the food I ate throughout the day, but it was tasty, vegan and gluten-free, so I think I was allowed the snacking privileges. My current couchsurfer (from Australia!) 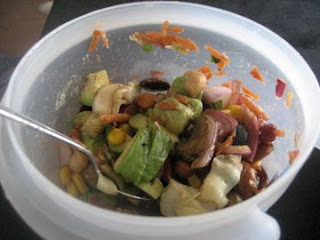 made this yummy salad for me: chickpeas, shredded carrot, avocado, sliced black olives, artichoke hearts, chopped red onion, canned corn, grilled mushroom, freshly-squeezed lemon juice, balsamic vinegar and raw almonds. The Sandwich consisted of toasted gluten-free sourdough bread from New Cascadia (bought fresh yesterday! 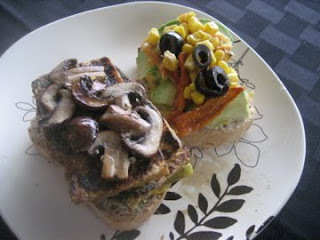 ), Wildwood Garlic Aioli mixed with French's yellow mustard, a slice of a Claussen Dill pickle, sliced avocado, homemade sun-dried tomatoes, sliced black olives, corn, sauteed mushrooms, and an amazing tofu bacon that came from my friend's site. When I tried to stack it together, I couldn't even fit it into my mouth because it was so big! But, I prevailed, ate it, and my stomach was so happy that I put forth the extra effort. These are the banana flax muffins that I made from the Allergen-Free Baker's Handbook, a cookbook full of 100 vegan recipes that are all gluten-, soy-, peanut-, tree nut- and sesame-free. Yum. I doubled the recipe so that I would be able to give some away, but it actually made more than the recipe said, so making one batch will probably make more than the 12 it says in the cookbook. Below is the original recipe, although I used chocolate chips in some and not in others, and the recipe technically calls for raisins. Preheat the oven to 350'. Put muffin liners into a muffin pan. In the bowl of a stand mixer, combine the oil and agave nectar, mixing on medium speed for about 20 seconds. Add the mashed banana, lemon juice, cinnamon, and nutmeg, and mix for 20 seconds. Add the flax meal and mix until well combined, about 10 seconds. In a separate bowl, combine the flour, xanthan gum, baking soda, and salt. Add the dry ingredients to the wet and mix on low until just combined, about 20 seconds. 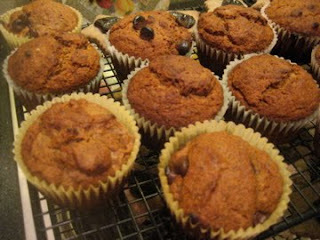 Turn off the mixer and fold in the raisins/chocolate chips/nothing. Fill the liners to the rim with batter. They will be heaping. Bake in the center of the oven for 20-25 minutes, or until a lovely golden brown on top, rotating the pan halfway through. Cool on a cooling rack. This was my first time making kolacky since becoming a vegan, let alone gluten-free, so I had to make quite a few changes. However, because the recipe itself is very easy, changing a few ingredients really didn't take too much effort, and the end result tasted basically the exact same as the non-vegan version that I recall. Cream butter and cream cheese until fluffy (it helps to use the stand mixer for this step). Beat in vanilla extract and sugar. Combine flour and salt; add in fourths to butter mixture, blending well after each addition. Chill dough until easy to handle. Roll dough to 3/8" thickness on a floured surface. 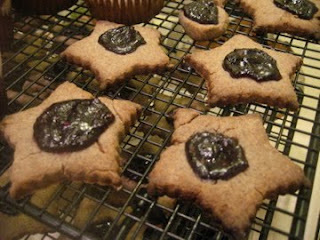 Cut out shapes (I used a cookie cutter shaped like a star) or a 2" circle. Place on an un-greased cookie sheet. Make a "thumbprint" about 1/4" deep in each. Fill with jam. Bake at 350' for 10-15 minutes, or until a little browned on the edges.